The weather turned suddenly chilly here this weekend, which put me in the mood for baking. Happily having all the ingredients on hand, I decided to try a recipe for Bourbon Banana Bread with Pecans and Dark Chocolate that I’d seen on the blog A Bitchin’ Kitchen. The recipe doesn’t specify a bourbon. I turned to Maker’s Mark, as I often do when baking (sometimes I even add it to the food, ha ha). 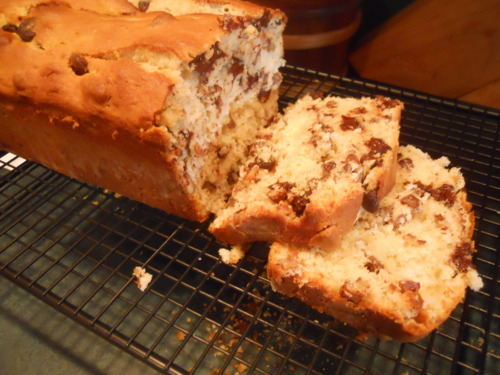 Its sweet flavor profile, with lots of vanilla and caramel, works well in quick breads. Look at all those dark chocolate chips! The final product cools on the wire rack. Dense and rich, this bread won’t last long! Preheat the oven to 350 degrees. 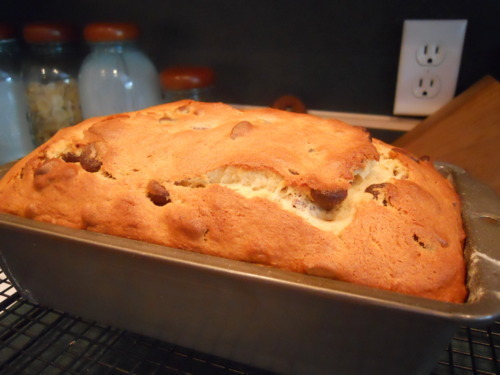 Grease and flour a 9×5 loaf pan. Set aside. 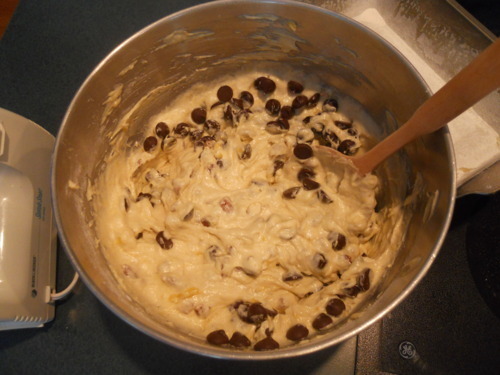 In a large bowl, cream together butter and sugar for 3 minutes. Add in eggs one at a time, and beat between each addition for 1 minute. 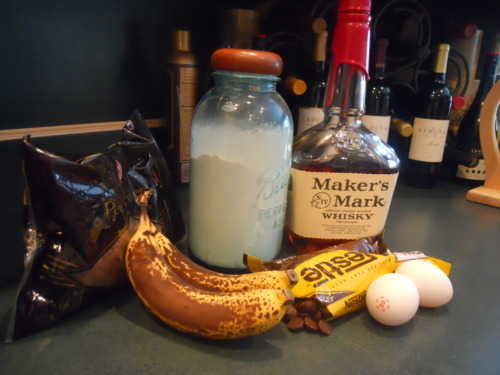 Scrape the sides and bottom of the bowl, and beat in mashed bananas, lemon juice, and bourbon until fully incorporated. Cool bread in pan for 25 minutes before inverting on a wire rack to cool completely. Check out A Bitchin’ Kitchen, which is written by two sisters, here.